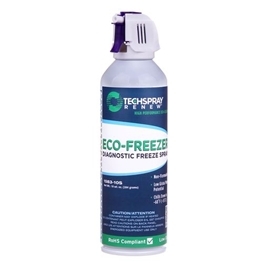 Techspray offers several varieties of electronic test equipment and diagnostic freeze sprays. 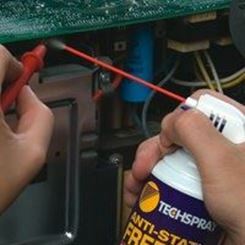 Freeze sprays are used to literally freeze electronics as a troubleshooting aid for intermittently faulting capacitors, resistors, semiconductors, and other defective components and equipment. Rapidly evaporating liquid that super-chills isolated areas. It also increases visibility of cold solder joints, cracks in printed circuit boards and oxidized junctions. Our Freeze sprays can be purchased right here on our site or from one of our nationwide distributors. 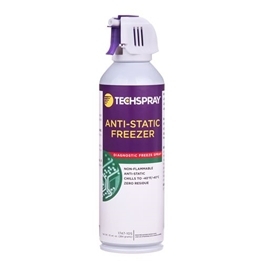 Freeze spray for static sensitive assemblies- Contains additive that avoids static build up, critical when working with ESD-sensitive components. 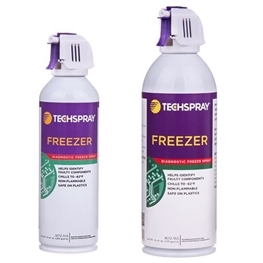 Eco-friendly freeze spray - Eco-Freezer is formulated with new HFO-1234ze propellant, with a fraction of the global warming potential (GWP) of HFC-134a based freeze sprays.